Available since May 2001! 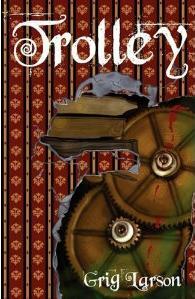 My first steampunk/horror novel. Heather January is a young girl living in a different time. It is a world where society’s technology is run by steam, gears, belts, chains, hydraulics, and a mysterious substance known as “trolley.” And Heather is dealing with a crisis of identity as a mechanically inclined girl in a man’s world. When she finds out her only protection from being forced to be lady-like, her professor, is going on a long trip, she takes matters into her own hands and tries to prove once and for all her gender will not be restricted by society’s boundaries. But the struggle is hard: her body is changing and sabotaging her efforts. Truant officers are hounding her every move. She receives a crippling injury she does not understand. And her maturing sense of social themes and sudden mood swings threatens to drag her down with bitterness and rage. But there is something else going on that no one wants to see; something wrong with the entire fabric of society that is beyond sexist struggles. Something worse. Far worse. Something is wrong with trolley.